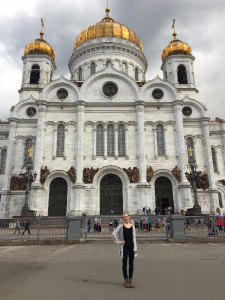 Rebekah is from St. Augustine, FL and participated in the 2017 Russia summer program. Здравствуйте! Меня зовут Ревека. Мне восемнадцать лет, и я живу во Флориде. (Hello! My name is Rebekah. I am eighteen years old and I live in Florida.) NSLI-Y was a wonderful and life-changing experience for me. I never imagined how much I would see and learn in six weeks. I was elated and honored when I received the scholarship to spend the summer studying Russian language and ballet in Moscow. I was not only a high school student and ballerina while I was in Russia, but I was also a student ambassador for the United States and the Russian American Foundation (RAF), a sponsor of this incredible program. During the summer of 2017, I had some of the most influential and wonderful experiences of my life. 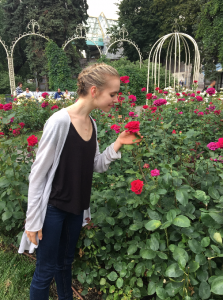 It was eye-opening for me to live in Russia and be immersed in their language and culture for six weeks. I believe it is important for young people to travel and learn about other cultures because it helps us dismantle stereotypes about certain countries and it teaches us to understand and respect various individuals and their cultures. Before I traveled to Moscow, I thought most Russians would be unfriendly, however, I discovered that this is definitely not true. Most of the people I met there were welcoming and really enjoyed seeing an American who was learning their language and interested in their culture and history. One of the most memorable encounters I had with a Russian was when a couple of friends and I ventured to a café in Red Square during our evening off. We ordered in Russian, and then the waiter inquired where we were from. He was fascinated that we were American students who were studying Russian. He practiced speaking with us and even taught us some new words and gave us a lesson on correct Russian pronunciation. It meant so much to me that he would take time out of his day to help us. I was extremely busy during the week. I spent four hours each day studying ballet and four hours each day in a classroom intensively learning the Russian language. The Russian language classes were challenging, but also extremely rewarding. On the weekends, I enjoyed spending time with my warm and gracious Russian host family at their apartment. I got to experience a glimpse of what it is really like to live in Russia. My host family showed me all the amazing sights that Moscow has to offer. I visited Red Square where I viewed the Kremlin, Lenin’s Mausoleum, and the iconic St. Basil’s Cathedral. I was mesmerized by all of the gorgeous historical buildings. For me, it looked like a fantasy, because they were so beautiful and ornately decorated with gold and brilliant colors. I am a photographer, so I was constantly snapping photos of the magnificent buildings, the beautiful parks, and the wonderful people I met while I was there. I also had the opportunity to visit many museums, restaurants, theaters, and art galleries. I love how much art and history Russia possesses.